Grease and lightly flour bottoms and sides of three 8-inch round cake pans, or spray with baking spray with flour. Bake 22 to 27 minutes or until top springs back when lightly touched in center. Cool 15 minutes. Remove from pans; cool completely.Spoon marshmallow creme into large microwavable bowl; microwave uncovered on High 15 to 20 seconds to soften. Add butter. Beat with electric mixer on medium speed until smooth. Beat in powdered sugar and salt until smooth.If necessary, trim rounded tops of 2 cake layers to flatten before assembling. Place 1 cake layer, top side down, on serving plate; spread with about 1/3 cup frosting. Top with second layer, top side down; spread with about 1/3 cup frosting. Top with untrimmed cake layer, top side up. Frost side and top of cake with remaining frosting. Store loosely covered. 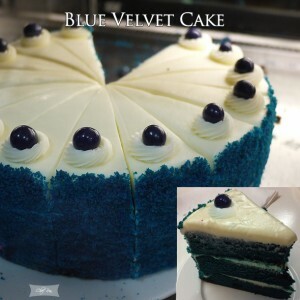 Tips: To get the royal blue velvet color, remember the toothpickful of violet paste food color; if forgotten, the cake will bake up turquoise in color.Use paste food color to achieve the royal blue velvet color. If you use liquid or gel food color, your cake color will vary.To make candy garnish, line cookie sheet with foil, and spray with cooking spray. In 2-quart saucepan, stir together 1 cup sugar, 1/2 cup corn syrup and 1/4 cup water. Cook and stir over medium heat until sugar dissolves; heat to boiling. Without stirring, heat to 300°F to 310°F, or until a small amount of syrup dropped into cold water forms hard, brittle threads. Remove from heat and stir in desired amount blue food color. Pour onto cookie sheet in random design. Let cool, and break into pieces. Garnish cake with candy pieces as desired.